In today’s health conscious and Instagram-ready world, the desire to grow fresh fruit and vegetables has never been greater. We’ve seen the beautiful photos of the carefully grown crops after harvest, and we want that same benefit for ourselves, our families, friends and neighbors. Even if you select semi-dwarf and dwarf varieties, you still need to understand that pruning is one the most important aspects of growing a fruit tree. Commercial growers use aggressive pruning techniques to control the size of a fruit tree, which results in more trees planted per acre (and a quicker return on their investment!) Keeping the trees at lower heights also makes it safer for workers and reduces liability for owners. For the home owner, keeping fruit trees small using size control techniques means the ability to have more fruit varieties in less space. You’ll also really appreciate the easier maintenance, while still enjoying rewarding yields of fruit. Don’t let the reality of a small lot stop you from growing fruit trees. Growing fruit trees does take some work, but there are many techniques that work beautifully to let you grow food on small properties. You can do it, but you need to be willing to look to the past for answers. The idea of growing more trees in less space has been around for thousands of years, and traces back to ancient Rome and beyond. Ancient gardeners from the walled gardens of Persia, to the European castles of the Middle Ages have practiced forms of size control of fruit trees. Prune year-round and into the growing season to keep the trees small. This technique includes extensive size control pruning during summer to keep the height reasonable, as well as doing winter cuts to correct the structure of the tree. See this example of a 10-year-old Santa Rosa Plum, which was raised on standard rootstock and then held to 40 inches tall. 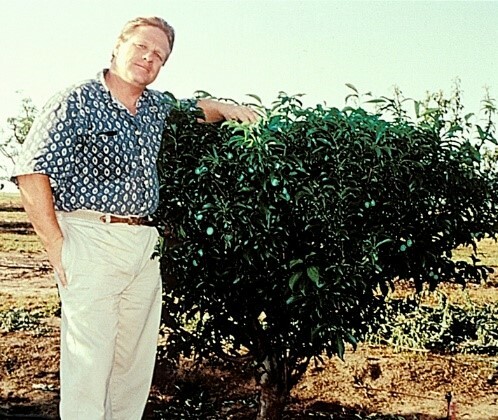 This tiny tree produced over 100 pieces of fruit a year! Espalier has seen a resurgence in recent years for numerous reasons. You’ll grow more fruit in less space and in many cases encourage earlier return on fruit set. You’ll also benefit from easier care and harvest. Espalier is now being done on Apples, Apricots, Cherries, Pears, Peaches, Persimmons, Nectarines and Plums. Even Figs and Pomegranates make great espaliers. There are few varieties of fruit that cannot be trained to grow flat. Citrus is ideal for espalier. Creating an espalier has some up-front costs that must be taken into consideration, but the return can be quite satisfying. Determine how wide your espalier trellis will be. We recommend 8 foot spacing between posts. 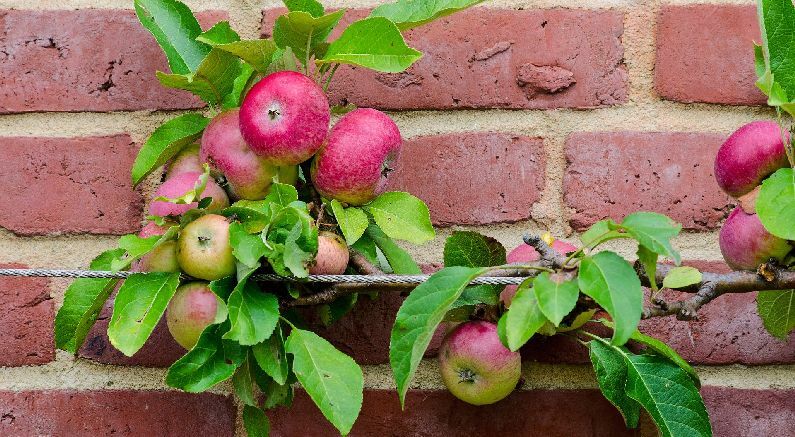 Establish your espalier at least 2 feet from any structure that may require maintenance in the future. You don’t want to have to remove your espalier trellis to do painting or repairs. 2 posts for every 8 feet. These should be a minimum of 4 x 4 treated wood or 2-inch galvanized cyclone fence post. Secure posts in ground with Fence Post Ready Mix at a depth of 2 feet into the ground. The top height of your espalier should be 6 to 8 feet tall. Plant trees in front of the center of your posts. You will be training the plant to grow into a flat fan shape. Tie off the closest limbs to the wire using garden twine or leather straps. Remove any branch that grows outward in the front or back. With espaliers, training is the key. Varieties like Apricot, Peaches, Nectarines and Plums grow quite fast and require extra attention. Apples, Cherries, Pears, Persimmons are slower growers and will take longer to fill out your trellis system. Hedge row with 2 or more trees are planted 18 to 24 inches apart in a row. 3 Trees in 1 Hole with trees planted in a triangle 18 to 24 inches apart. 4 Trees in 1 hole with trees planted in a square 18 to 24 inches apart. High density planting allows more plants in less area, provides a pollinator for your favorite variety of fruit and extends the time you are enjoying fruit from the precious space in your garden. When choosing fruit varieties to be planted together, chose varieties that cross-pollinate each other with overlapping bloom seasons. It’s a great idea to choose varieties that ripen at different times for a successive harvest. You should also select varieties that have similar care and spray requirements. We don’t want to be spraying our Apples while harvesting our Peaches! Apples can be planted with other Apples, or Pears. Peaches can be planted with Nectarine. Plant Cherries with other Cherries. Plums work well with all stone fruit. The primary rule is to never let any of the varieties dominate. This is of particular concern in the first 3 years while you are establishing your planting. Prune whenever necessary to keep one or more varieties from overpowering the planting. Prune to allow sunlight and air penetration. In the case of the 3 or 4 in one hole, view them as one single multi-trunk tree and prune to keep the center of the 3 trees. Your goal is to keep the center open to let sunlight into the lower canopy and the ripening fruit.